A complete storyboard is not only made of drawings, but also dialogue, actions, and valuable indications. 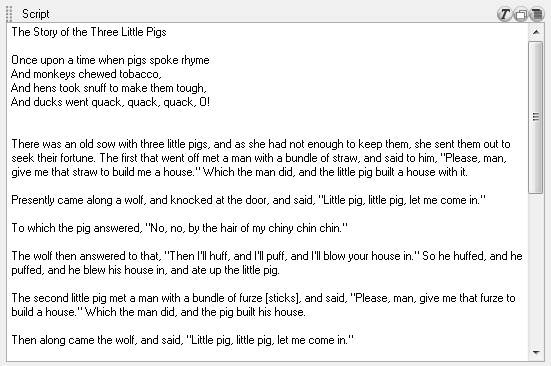 In Storyboard Pro, you can easily import a script into your storyboard project to help edit captions. 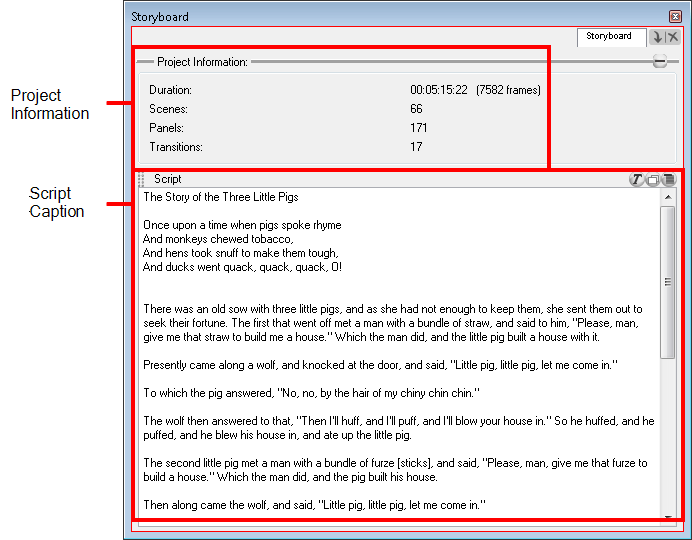 The Storyboard view lets you import a script into your project. By default, this view has a caption field specifically for the script. As opposed to the Panel view, whose content is sensitive to the selected panel, the contents of the Script panel stays the same no matter which panel is selected, allowing you to easily glance at information for the entire storyboard. This collapsible section of the Storyboard view is where information, such as the duration and number of scenes and panels are displayed. If your storyboard has sequences and acts, the total amount will also be displayed in that section. 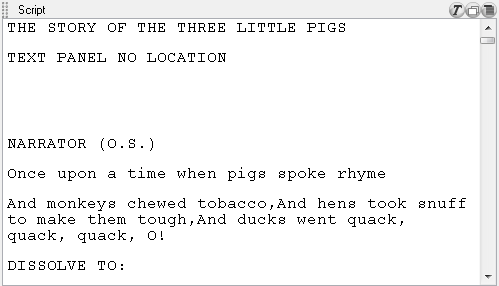 You can click on the Collapse button to hide the section and leave more room for the Script caption field. Once it is collapsed, you can click the Expand button to display the entire section again. This default caption field is specifically there for your script. You can use the Caption Menu button to access the import commands and the Text Formatting button to display a handy toolbar to format your text. Once a script is imported into the Script caption field, you can drag and drop the text to other caption fields—see Formatting Text and Drag and Drop Text. If you created your script in Final Draft, importing it into Storyboard Pro should be your next step. While importing your Final Draft script, you will retain the rich text formatting. If you are working with Final Draft version 8, you can import the project file which is a *.fdx file. If you are working with Final Draft 7, you must export your project as an *.xml first—See Exporting Your Final Draft Version 7 Script as an *.XML File. In the Storyboard view, click the Caption Menu button and select Import Final Draft Script. The Select Final Draft browser opens. Select your Final Draft *.fdx or *.xml file and click Open. The script appears in the Script caption field with all notes and formatting intact. NOTE: Iif you are working with Final Draft 8, Storyboard Pro can directly import the *.fdx project file. If you are working with Final Draft 7 and earlier, you must export your project from Final Draft as an *.xml first, so you can import it in Storyboard Pro. Here is a simple step by step to help you export your Final Draft *.fdr project to an *.xml file using Final Draft Tagger in version 7. Start the Final Draft Tagger software. Select File > Import Script, the keyboard shortcut is [Ctrl]+[I] (Windows) or [⌘]+[I] (Mac OS X). Close the Final Draft Tagger application.